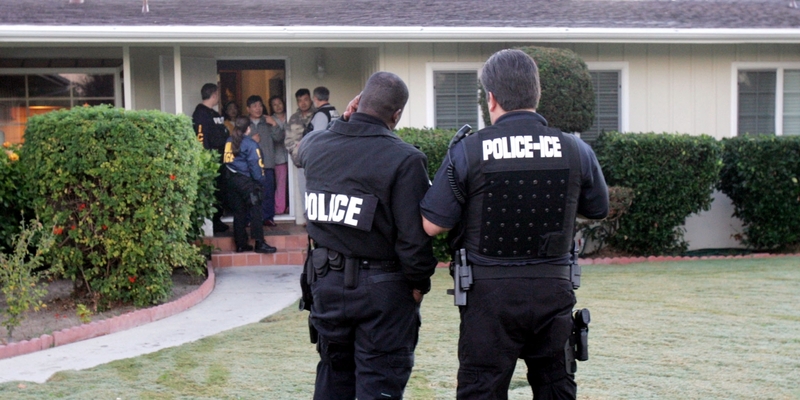 Members of the immigrant removal task force of the Immigration and Customs Enforcement (ICE) outside a home, during an early-morning raid to arrest and deport an immigrant. Orlando crossed into the U.S. when he was 13 and spent much of the next 33 years in Texas. Initially, Orlando worked in agriculture, but eventually he opened a mechanic shop and helped his wife open a beauty salon. He was so used to life in the U.S. that when he got into an argument with his brother, Orlando forgot “the cardinal rule” of many undocumented immigrants: “Never call the police.” He ended up in jail with a domestic assault charge, despite his brother signing a statement declaring that Orlando never hit him. There are others. Alfredo had been brought to Utah as a toddler. When he was 17, he returned to Mexico to take care of his father, who was severely ill, but has been unable to return to the U.S. in his five attempts to cross the border. “I had my whole life over there,” he said. Twenty-seven years ago, Guadalupe left her small children in Mexico, sending money back for them until they finally joined her in Alabama as teenagers. At 56, she returned to Mexico to visit her aging siblings and became stuck there, getting caught twice trying to get back into the U.S. to join her children — and grandchildren. And there are others still — many of them. Adriana, Orlando, Alfredo, and Guadalupe are four of the 226,119 men, women, and children deported from the U.S. in 2017. On Tuesday, the Department of Homeland Security released its end-of-year immigration enforcement numbers — “the results of a year-long return to enforcing the law, upholding the integrity of our lawful immigration system, and keeping America safe,” the agency said in a statement. Alfredo, and Guadalupe (whose real names were withheld) along with 39 other deportees — reveal that many of those removed had long-established lives and deep family connections in the U.S. Some lived and worked here for decades. Many are married to American citizens and have American-born children. Human Rights Watch found that the number of people detained inside the U.S. rather than at the border — meaning that they were not new arrivals — increased by 42 percent over last year, while immigration arrests of people with no criminal convictions nearly tripled. As The Intercept reported earlier this year, the Trump administration has gone out of its way to portray its immigration crackdown as a matter of public safety. Former Secretary of Homeland Security and current White House Chief of Staff John Kelly at one point directed Immigration and Customs Enforcement officials across the country to highlight to the media the “most egregious cases” of criminal apprehensions. From Donald Trump’s Inauguration Day to the end of this fiscal year, 110,568 people were arrested inside the U.S., compared to 77,806 during the same time period in 2016. Among those, 31,888 had no criminal convictions, compared with 11,500 during the same period in 2016. The Human Rights Watch review, confirmed by the figures released by the DHS on Tuesday, shows that the arrest and deportation of immigrants with deep ties to the U.S. and minor or no criminal history was not an exception — or a matter of “collateral apprehensions,” as ICE has sometimes dubbed arrests of immigrants who are not targets of enforcement actions — but the norm. As soon as he took office, Trump, whose anti-immigrant vitriol was a campaign trademark, signed two executive orders making nearly all undocumented immigrants target for arrest, detention, and deportation regardless of family ties, time they spent in this country, and criminal history. In September, Trump also rescinded stays on deportation granted through the Deferred Action for Childhood Arrivals program, putting 800,000 young people brought to the U.S. as children in limbo and at risk for deportation. “The impact of these actions has been immediate and severe,” the Human Rights Watch report notes. As the figures released by the DHS on Tuesday show, while the number of people arrested on the interior has soared, the number of those arrested while crossing the border is the lowest in decades, undercutting Trump’s argument for his signature campaign promise of a border wall. While immigration officials credited Trump for the drop in border crossings, and the anti-immigrant climate he has fostered is undoubtedly a contributing factor, the declining numbers are actually consistent with an ongoing trend, as fewer people cross the border, turned away by already effective fences and patrols. Fewer Mexicans, in particular, have been trying to reach the U.S. — while many have been making the journey back home — as opportunities dwindle here and economic prospects improve there. While the wall has not yet received a green light, six companies were chosen to build prototypes and, last month, the House Homeland Security Committee approved a border security bill that includes $10 billion for the wall. Estimates for the wall’s cost vary widely, with some reports calculating that it will soar as high as $70 billion (plus $150 million a year in maintenance) and others placing the number between $27 billion to $40 billion. Trump has promised to build it for a much cheaper $12 billion. Meanwhile, on Tuesday, Republican senators introduced legislation offering protections for those currently covered by DACA — though no path to citizenship — in exchange for more immigration enforcement agents, technology, and judicial resources, as well as the elimination of sanctuary policies and provisions for the expedited removal of certain individuals. “The bill would result in mass deportation and mass terror — coming after most immigrant youth, our parents, families, and friends,” Reyna said. For those interviewed by Human Rights Watch and their families, that terror has already become a reality. daughter, Rosie, before she initially decided to move to Texas because of growing violence between cartels and police at home. The family split up to make the journey: Rosie, who was 2 years old at the time, crossed the border in a car with a family friend; Adriana’s husband Ricardo showed his U.S. passport at the border; and Adriana walked for eight days across the desert.